The NBA gets all the press when compared to its women’s league known as the WNBA. But regardless of the fanfare, the American women’s basketball league has produced quite a few talents whose names will be enshrined in history, one of who is Stacey Dales, a former Washington Mystics and Chicago Sky player. Dales was a basketball player for a total of five years in the professional league before she retired to pursue a career in sports journalism where she has been working for the NFL Network as a reporter. As a country, Canada can be proud of a number of things, including having one of the best female basketball players to ever play in the WNBA. Stacey Dales was born in Collingwood, Ontario on the 5th of September 1979 to parents Jim Dales and Heather Dales. For a journalist, there is a substantial amount of information about her that is unknown to the public, including her childhood details like her early education and the occupation of her parents. Notwithstanding, we know the journey of the future Hall of Famer continued at Thousand Islands Secondary School where she began playing competitive basketball. As a high school student, Stacey Dales became the face of basketball excellence. She helped her team to three basketball championships, winning the Ontario ‘AA’ high school senior girls basketball championship from 1994 to 1996. With the kind of excellence that Dales exhibited at a high school level, it was no surprise that she became the toast of a few stateside college women basketball programs who sought to have the best talents on their team. Dales eventually went with the University of Oklahoma. She played a total of five seasons for the college team during which she recorded statistical excellence like scoring 1920 points over the course of 132 games and finishing as the assist leader in the Big 12 Conference. Stacey Dales may not have managed to win a championship during her time at Oklahoma but she was more than able to record a few individual achievements. Prior to the completion of her college career, the Canadian was nominated as an All American in 2001 and 2002, the same years she received awards as the Player of the Year in the Big 12 Conference. After finishing her college career, the shooting guard was drafted by the Washington Mystics as the 3rd overall player in the 2002 WNBA Draft, making her the highest drafted Canadian player in the league. She spent the next two years playing for the Washington Mystics and made the All-Star team in her first year as a player. Unfortunately, following the diagnosis of a disease known as Raynaud’s Phenomenon, Stacey Dales was forced to retire from the game in 2004. She, however, did not spend long on the sidelines. She returned to the league after a year in retirement and joined the Chicago Sky where she played till 2007 before announcing her final retirement. Although she did not get enough time to express her wealth of talent in the league, Dales still managed to finish her career as the 4th ranked player for 3 points scored. The end of her basketball career signaled the start of another as a journalist. The wealth of experience she garnered from playing professional sports and her own knowledge of basketball and other sports like football came in handy as she began a role as an analyst for ESPN for its coverage of college male and female basketball games and college football. 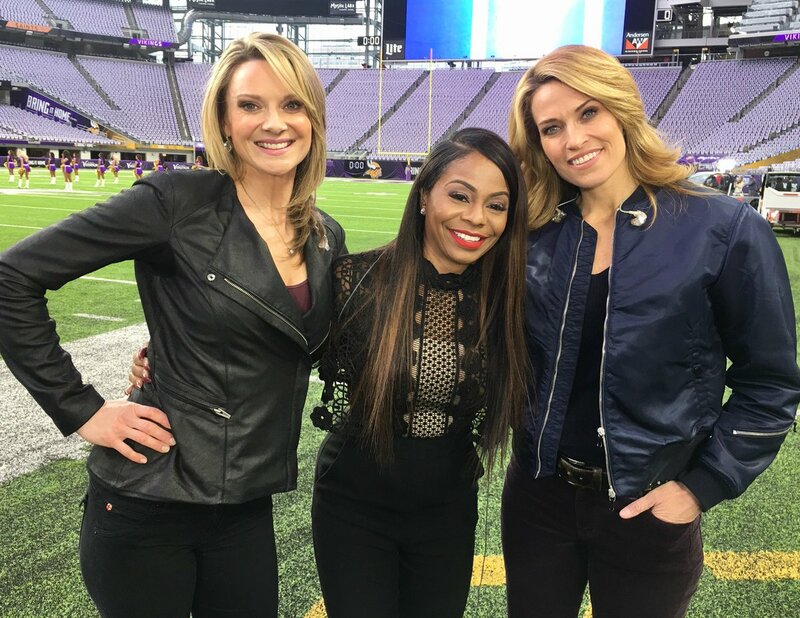 Unfortunately, a contract dispute eventually brought this to an end until she was snapped up by the NFL Network who signed her in 2009, first as a host of the show, Gameday Morning before she was later redeployed as an on-field reporter where she has remained in the thick of the action ever since. Furthermore, she has worked for Universal Sports as a correspondent during the 2010 Winter Olympics in her home country of Canada. Is She Married or Dating Anyone? Stacey Dales for a brief period in her life was a married woman. She was married to her longtime boyfriend Chris Schuman from the 13th of April 2002 to sometime in 2004. She does not have any children. Stacey is at the moment believed to be focusing on her burgeoning career as a reporter and isn’t in a relationship. 1. Her brother, Burke Glover played football in the Canadian Football league for ten seasons. 2. She is related to Jason Arnott, who is a cousin of hers. Jason Arnott is notable for playing 18 seasons of professional ice hockey in the NHL.